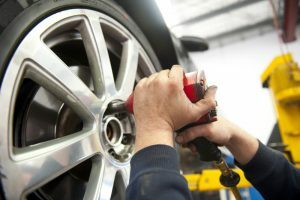 Professional automotive repair services in Hesperia, CA, should be pursued whenever a tire begins to display common signs. These flaws are easy to pinpoint during an inspection in a residential area, so you can quickly address minor issues before they develop into major problems without any hassle. Gaps usually form along the sidewall of a tire in a spot that’s close to the bead. This kind of opening usually protrudes next to carcass plies. If you can see the ply cords clearly, a sharp road hazard probably made the crack on the tire. The bead isn’t severely damaged. The internal cord isn’t bruised. The tire isn’t overloaded or underinflated. When a tire rolls over a pointy object on the road, a cut or puncture will develop along the tread. Cuts and snags are easy to pinpoint, as they can damage the ply cords and belt. If a road hazard punctures the tire, you’ll notice it immediately because the inflation damage will cause a severe separation issue. In some cases, a bulge can’t be adjusted if an object punctures the rubber in the same spot where a previous separation occurred. This is why cuts and punctures should always be repaired by a reputable Hesperia automotive technician to ensure safety. Many of the roads that run through highways in Hesperia, CA, have chips and cracks that can generate rim bruises. These flaws develop on a tire after the wheel jumps and make an impact upon landing. As the tube bounces on the ground, the bruises happen when the sidewall is jammed against the rim. If your tire has this type of damage, you’ll have no problems spotting the damage since the scuffs usually appear on the outside of the wheel near the ply cords.